The animals known by North American inhabitants as caribou and by Europeans as reindeer are the same species, Rangifer tarandus. Native and widespread across the Arctic tundra, caribou spend most of their lives on the move. Caribou travel up to 3,000 miles a year, and their migrations are the longest documented movements of any land animal. Large regional herds of between 50,000 and 500,000 animals travel seasonally, taking advantage of food resources while avoiding predators and coastal insects. The ancient caribou once shared grazing grounds with prehistoric mammals such as mastodons and woolly mammoths. The extensive annual migrations are one of the main reasons caribou continue to exist while many other species have gone extinct. In North America, caribou herds still use the same migration routes and river crossing points their ancestors used as much as 27,000 years ago. While there are still large wild herds of caribou, some have been tended by humans going back 3,000 years. Caribou are the only deer to have been domesticated on such a widespread basis. The spring melt of arctic snow triggers pregnant females to begin the annual caribou migration to calving grounds, where the herd will pause briefly while calves are born. The other members of the herd follow the females one or two weeks later. Caribou calving grounds are located in the northernmost limits of the species’ geographical range and are inaccessible during the winter months. The spring migration is particularly arduous, especially for the pregnant females that have so little energy they can often travel only 10 to 12 miles a day. Deep snow and spring floods also hinder the herds’ passage. As spring turns to summer, mosquitos and flies proliferate in caribou calving grounds, which are frequently close to the Arctic Ocean or other large bodies of water. The herd gathers and smaller groups numbering in the hundreds or thousands leave the calving grounds. These small herd factions disperse to locations within the same general geographic area, seeking grazing spots with plenty of vegetation but without the harassment of insect swarms. Areas further away from large bodies of water with cooler temperatures and less humidity are preferred, as these areas tend to have fewer mosquitos. A stiff breeze also keeps the annoying insects away from the caribou. 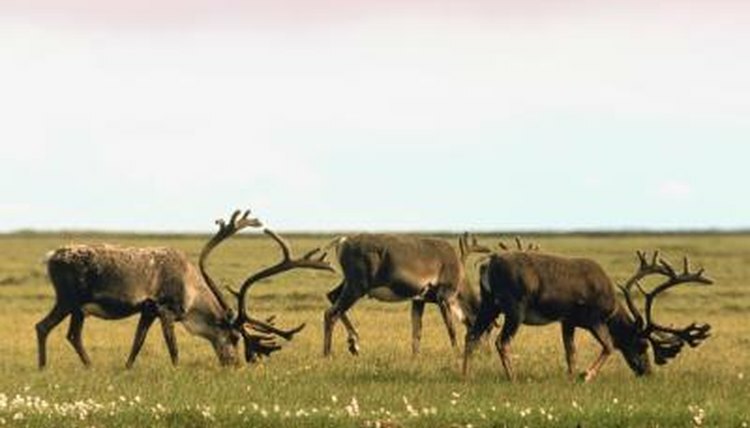 As temperatures decrease in the fall, caribou herds gather and slowly head southward. The fall migration starts at a more leisurely pace that will be dictated by the weather as the animals progress. They speed up if triggered by a sudden temperature drop or substantial snowfall, but if it warms up, migrating caribou will slow their pace or even reverse course. Along the way, bulls become increasingly aggressive and sparring becomes more frequent, culminating in a brief breeding period before the herd arrives at its winter range. Winter is the only season of the year when caribou herds remain stationary.